This deep conditioning hair masque is designed to replenish moisture to very dry, damaged, and over treated hair. The hair conditioning masque should be used weekly as a deep reconstructive treatment. For extremely dry, damaged hair, more intense results can be obtained if used with a Heat Therapy Wrap. The Masque should only be used when EXTRA conditioning is required or if you have extremely dry damaged hair. It is formulated to work with the Nisim NewHair Biofactors line of products as well as the F.A.S.T. Shampoo. It contains the same nourishing active ingredients found in our other products. The masque can be used as required, either as a weekly (or occasional) treatment of a daily conditioner (for very damaged hair). The masque is safe to use with chemically treated hair and all hair types. Extra conditioning can be achieved by prolonged usage or with the application of heat, using a heat cap or hair dryer. A small amount can be rubbed into the hands and sparsely applied to the hair ends (on damp hair) to provide the utmost in detangling moisturizing and shine. actually i used many kinds of masques. this is my best one. i love it! i got this in the mail really fast, so that was really good too! okay, so when i deep condition, i deep condition for as long as i can! to get my moneys worth! i have been using the Nisim "F.A.S.T shampoo & conditioner" for around a week or so, and it has been pretty drying on my hair! 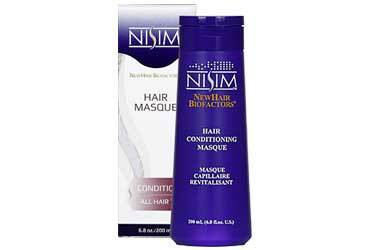 so when i saw this Nisim hair conditioning masque on amazon, i had to get it! my hair is also sooo manageable now!!! i love it!!!! (: thanks Nisim! This is by far the best conditioner I have ever tried! !My hair is brittle,dry,and dyed blond for the last 15 yrs. which takes a toll believe me.This masque made my hair after the first use -beautiful feeling- soft as silk and actually able to style it without straightener. Its a awesome product -you have to try it !! I have never had any problems with dry hair until this summer. I had absolutely no idea how to fix it and was devastated with how my hair was looking. Of course, I tried all of the typical drug store deep conditioners but found that none of them helped. 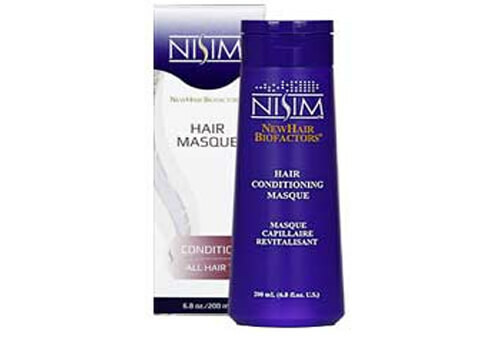 A friend recommended NISIM to me, and after reading other reviews I decided to try the conditioning masque. I absolutely love it! I use it about twice a week (which is more than they suggest, but it is what works for me). After using this masque for two weeks, my hair is back to it's old texture. I have noticed a little bit of growth as well. I would definitely recommend this to anyone who is struggling with dry and brittle hair. It works like a charm!